Imogen's Typewriter. 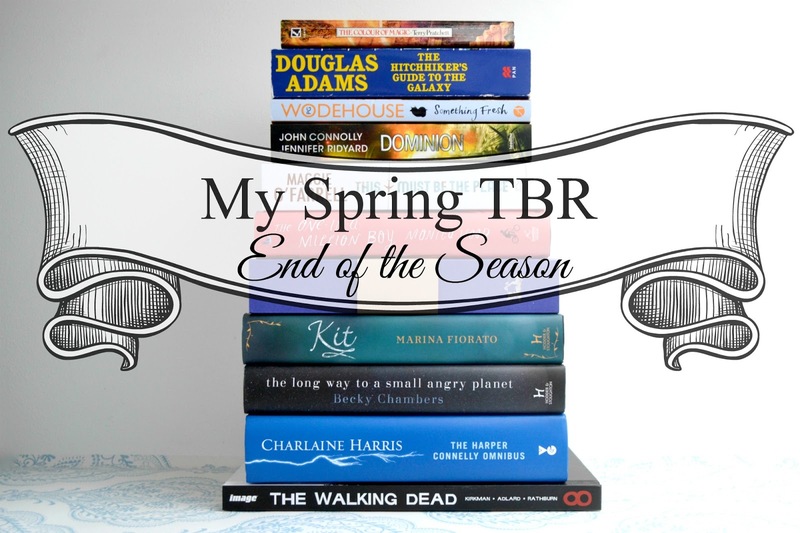 : My Spring TBR: End of the Season! Terry Pratchett's Discworld series is still on my mind but I've been thinking about re-reading a different series and I don't like to have too may series on the go. I'll get to it! Maybe in Winter? I still need to figure out the order either way, so if anyone knows I'd love some help! The Hitchhiker's Guide to the Galaxy by Douglas Adams is definitely joining my Summer TBR. I just bought the audiobook with Stephen Fry and Martin Freeman (haul coming soon) since I've been kind of getting back into audiobooks lately. So a friend and I are going to listen/ read it together! The Blandlings Castle series by P.G. Wodehouse is back on the shelf for now, although I am really enjoying historical fiction lately... And don't even ask about Dominion by Jennifer Ridyard & John Connolly* though. I'm so ashamed I haven't got around to hit yet. Soon! I promise! The One-In-A-Million Boy by Monica Wood* and This Must Be The Place by Maggie O'Farrell* were both picked up and I got about ten pages in before putting them back down. I could just tell they weren't for me, not at this moment in my life. But y'know, I thought the same about Tenacity this time last year so we'll see. I did read Katherine of Aragon, The True Queen by Alison Weir! And boy, it took me over a month to get through. I loved it, don't get me wrong, but it was an intense read and took time. I'm definitely glad I don't have a big Goodreads reading challenge because I'm only at 29 and 7 were graphic novels/ comic books. After my Books I 'Paused' in 2015 post I wanted to pick up Kit by Marina Fiorato* and The Long Way to a Small Angry Planey by Becky Chambers* again. They sat on my bedside table but I haven't got around to them yet. I still want to, they might not both join my Summer TBR though. The Harper Connolly Omnibus by Charlaine Harris** was actually the first from my Spring TBR that I picked up and I read two of the books before putting it back down. I'm liking them, I just took a break to read other things. I plan to finish them real soon and do a lil' giveaway too. After finally getting over the truly awful Season 6 finale of the show, I picked up 5 hardcovers of The Walking Dead comic in Spring. I love The Walking Dead and after revisiting the comics, I think I prefer them to the show! At least dumb cliffhangers are resolved in a month. Overall, I've seen more successful TBR's. I think 11+ books were too many. Hopefully Summers (coming Monday) will be better. How was your reading in Spring? *I was sent these books to review. I am not obligated to talk about them.